Ashoka Halwa is a festive sweet and is very popular in Tamil Nadu.. The dish can well be called the emperor of sweets, for its rich taste. It is more in the genre of halwa. “It is popular in the delta region particularly in the Thiruvaiyaru area. 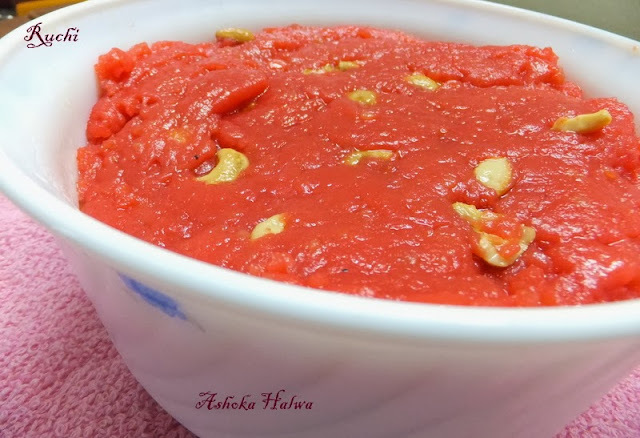 As much as Tirunelveli halwa taste divine, this too equally nice variation and this halwa just melts in your mouth and the taste lingers on;I make this halwa often for my family since my husband likes this lot. 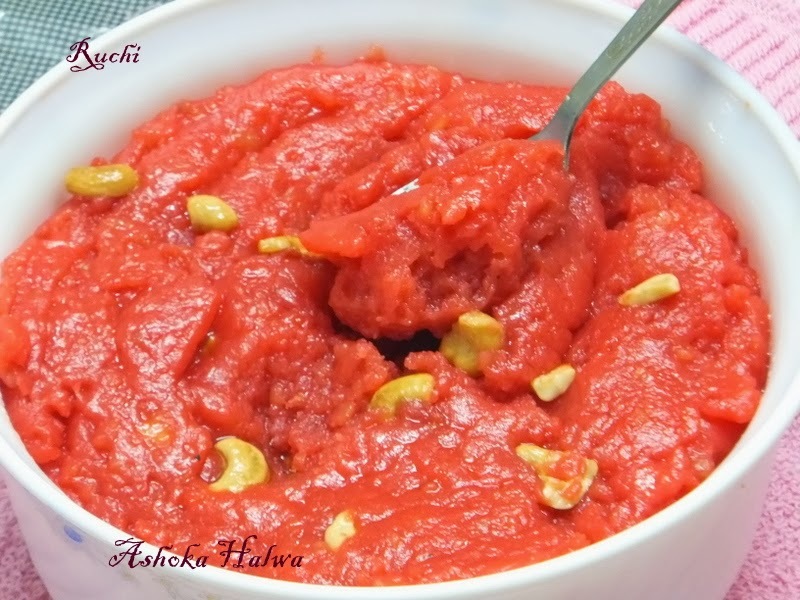 This time along with other Neividhyam I Prepared this halwa for Navarathri . Warm milk - 2 tbsp. Saffron food colour - 1 tsp. 1. Dry roast the Moongdal in a kadai till it releases a nice aroma. 2Then cook moong dhal with enough water till it is soft. Mash the dhal and keep aside. 3. In a pan, add little ghee and roast cashew & raisins Keep aside. Add saffron strands and saffron colour to the warm milk. Mix them & keep aside. 5. Take 1/4 of water and add the sugar. Boil the sugar syrup until 1 string consistency is reached. 6. Add the wheat /Maida flour and the mashed dhal in sugar syrup and mix well without lumps &Stir the mixture continuously until it thickens. 7. Add the saffron and milk and also kesar color and stir well. Add ghee in regular intervals and keep stirring, till the ghee oozes out of halwa and the halwa rolls like a ball without sticking on the sides of pan. Halwa is just inviting me Akka, wat a traditional sweet.